This blog will show all the posts , photo albums and videos contributed to the butterflies by the students of St. Mark's Girls Sr. Sec. School. 1.Butterfly Facts : Butterflies don't have Wings. 2.Butterfly Facts : Butterfly doesn't spin a cocoon. 3.Butterfly Facts : Wings that can hear! 4.Butterfly Facts : Butterflies cannot fly if their body temperature is less than 86 degrees. 5.Butterfly Facts : Strange feeding habits! 6.Butterfly Facts : The chrysalis that sings. 7.Getting to know more people. . .
8.Butterfly Facts : Butterfly tricks. 9.Butterfly Facts : The wierdest caterpillars on earth. 10.Butterfly Facts : Butterfly eyes!! 11.Our first visit to . . .
12.Butterfly Facts : Skipper-butterfly or a moth?? 7.In my garden. . .
4.Inside a Cocoon . .
5.Moth caterpillar tyurning into a chrysalis. 2.In my nearby garden . . .
4.World of Incredible Butterflies - Dependence of butterflies on Outside Warmth. So , this is the contribution from our school and our students. Butterflies aren't for Free or Profits! Butterflies aren’t for Free or Profits! The illegal wildlife trade in India is estimated at several thousand crore, the third most lucrative after arms and drugs, and it isn’t just tiger skins and penises. A major part of it includes the small things people don’t notice — such as butterflies, nature’s winged jewels which have been referred to as ‘flagships’ and ‘honorary birds’. They are valuable pollinators when they move from plant to plant gathering nectar. Butterflies are one of the important foodchain components of the birds, reptiles, spiders and predatory insects. They are also good indicators of environmental quality as they are sensitive to the changes in the environment. But the smuggling of butterflies is a cause of concern and requires immediate attention lest all these jewels would vanish which would be disastrous. Various schedules of the Wildlife (Protection) Act, 1972(henceforth WPA), dictate the level of legal protection given to species of Indian animals even to insects like butterflies. But the shortcomings of the schedules of the WPA with respect to insects have been pointed out, but no solutions have been suggested as yet. Analysis have even shown that a large proportion of species with high conservation values, many of them narrowly endemic and endangered, are not listed under the WPA, indicating the need to expand thelistings. As for catching the culprits, over the last 20 years or so, a handful of cases against the violators have been registered. They involve foreign collectors or scientists trying to smuggle butterflies and other insects. But the majority,as in the case of Nadukani, the culprit simply flies under the radar or is not treated with the seriousness it deserves, this can be attributed to the lenient and casual treatment of the Indian Government. With its varied climatic zones, India is a haven of diversity, and this extends to butterfly species as well. According to Ashok Kumar, a former IAS officer who has worked for the AndhraPradesh Wildlife Advisory board and is vice president of the Butterfly Conservation Society, the North East alone has about 900 species, compared to 56 in the whole of the UK.The sheer diversity of species is mind-boggling”, he says. No wonder the ‘bio-pirates’ are dazzled by the wealth they confront, literally. During arecent survey around the Darjeeling area, it was revealed that most of the major butterfly species had almost disappeared. Hence, today’s market for butterflies is a bit like the shark fin craze, everyone wants it because they can all afford it. Earlier, only collectors bought butterflies but now it’s a business that’s diversified as it expands. They are widely used in greeting cards, paper weights, even jewellery. Experts in the conservation business rue the fact that more attention isn’t paid to the depletion of insect populations, both through smuggling and environmental degradation. According to Tej Kumar, president of the Butterfly ConservationSociety in Andhra, wildlife conservation in India has come to focus almost exclusively on the tiger. Butterflies get their name from the yellow brimstone butterfly of Europe that is first seen in the early spring or "butter" season. Female Queen Alexandra butterflies, from Papua and New Guinea, are the largest in the world, some with wingspans larger than 26 cm. Butterflies and moths are found on all land masses except Antarctica. The atlas moth, one of the largest silk moths, can be mistaken for a medium-sized bat when flying. There are over 2,000 species of butterflies in the rainforests of South America. Butterflies belong to, alongside with moths to an order called Lepidoptera. The fastest flying butterfly is the Monarch, which has been clocked with a speed as high as 17 miles per hour. Butterflies are further divided into 30 orders, the main basis of classification being their wing structure. a segmented body in which three body parts, a head, a thorax and an abdomen can be distinguished. A butterfly's taste sensors are located below their feet. The color in a butterfly's wings does not come from pigment. The color is produced prism-like by light reflected by their transparent wing scales. The largest butterfly is the Queen Alexandra's birdwing butterfly from Papua New Guinea. The wingspan of the butterfly can reach to be almost one foot. A butterfly has to have a body temperature greater than 86 degrees to be able to fly. A butterfly can see the colors red, green, and yellow. I am back with yet another blog.We have heard about many laws , local as well as national , for the protection of butterflies in India.But still there are many more organisations and societies which are promoting butterfly conservation through their interactive sessions and programs.Todya , we will be talking about these organisations and societies.So , let us begin. WWF-INDIA is one of the largest conservation organisations engaged in wildlife and nature conservation in the country.This organisation plays an important role in the conservation of butterfliy species , especially the Kaiser-i-hind butterfly.This specie is also known as the Emperor of India due to its shimmering greens, bright yellows and delicate blacksThe Kaiser-i-Hind is a local and rare butterfly which is protected by Indian and Nepalese law. Protection enforcement in these countries not being effective, it is hunted and collectors pay heavy prices.The two species of Kaiser-i-hind were listed in CITES, Appendix II from 1987 onwards.IUCN has listed this butterfly in the ''Near Thretened '' category.It is also threatened by limestone mining activities. WWF-India is working to conserve the habitat of this butterfly through its different landscape programmes in Eastern Himalayas. BNHS has been promoting the cause of a natural India for the past 127 years since 1883.It organises nature trail camps covering a wide variety of habitats in India from the snowy Himalayas to the rain swept forests and deserts.The objective is to connect people to nature conservation, advocate eco-tourism and encourage local participation.It encourages conservation by making CECs( Conservation Education Centre ) in Mumbai and Delhi.It also organises Training sessions, Workshops, Nature Trails and Customized Programs for adults, children, families and corporates to create awareness about conservation.It has played a major role in butterfly conservation. A small area outside CEC is developed in Butterfly Garden. There are several foodplants as well as nectar plants planted in this garden. At any given time, visitors get to see butterflies seeking nectar or a caterpillar chopping away the leaves and if one is lucky they may get to see butterflies laying eggs or butterfly emerging from a pupa. It has been publishing the BNHS journal since1886. a. To generate interest in butterflies and their conservation among young and old. b. To create awareness among people about the beneficial role of butterflies and other insects their habitats towards a healthy ecosystem. c. Networking with other organisation in nature conservation including research and also to conduct workshop and training programmes to enhance knowledge on this subject. d. To provide, equip and maintain a museum and other repositories for butterflies and other insects along with herbarium consisting of butterfly flora which provide nectar for adults and larval food plants. e. Assisting educational and other institutions and in individual homes and parks for erecting butterfly gardens/parks in their premises. f. Develop database on butterflies available in AP and to prepare field guide on butterflies in Andhra Pradesh. g. To bring out a newsletter on butterflies to publish and exchange information on butterflies. This organisation has successfully launched an initiative for the conservation of butterfliesThe primary objective of the programme has been to initiate people into the fantastic world of butterflies and to encourage them to get involved in butterfly study and conservation. 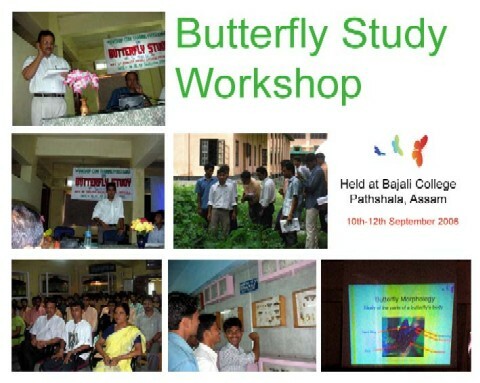 A training programme on butterfly study and strategies for their conservation has been designed as part of their effort to create a group that conducts research and field studies on butterflies and to gradually build a network that furthers long-term butterfly conservation at national and international levels. The programme has been quite successful and over the past six months they have conducted camps in different parts of Assam, reaching out to over 70 undergraduates and high-school students. This has been achieved by working with Departments of Zoology in different colleges where life-sciences are taught, as well as networking with environmental NGOs working in the field of wildlife conservation. Their on-going efforts have helped them to initiate individuals into more systematic butterfly study and consequently form a framework for a much-needed butterfly conservation network. 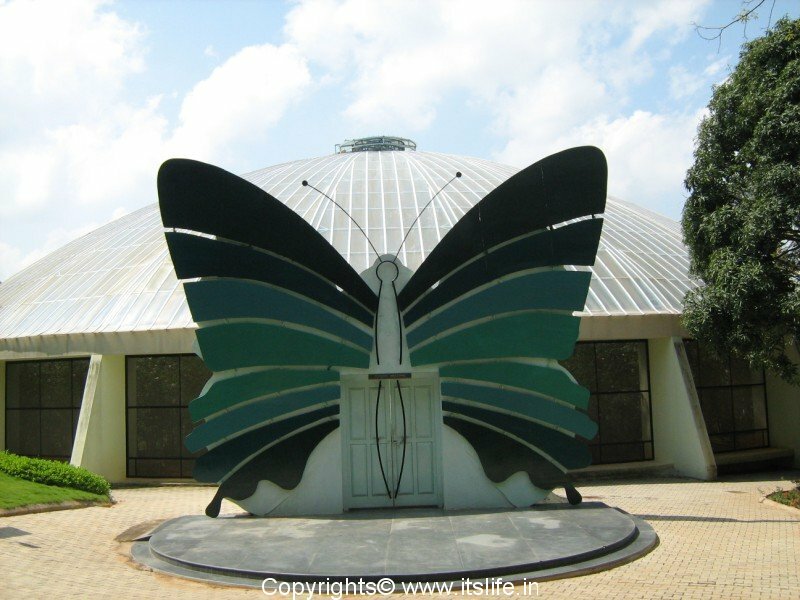 The country's first Butterfly Park was established at the Bannerghatta Biological Park.THE BUTTERFLY PARK comprises a butterfly conservatory, museum and an audio-visual room. The environment has a tropical setting — complete with the humid climate, an artificial waterfall,a narrow walking bridge and host plants and shrubs that attract butterflies. The conservatory leads to the second and third domes, which house the museum containing dioramas and exhibits of carefully preserved,exquisite butterflies. the entrance to butterfly park. SOME OTHER MEANS. 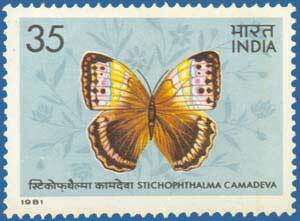 . .
Th government has been promoting the conservation of butterflies through stamps. Now , we come to an end of this blog.I hope that the government keeps promoting the conservation of butterflies. sorry for the delay. today am gonna tell u about anoyher endangered butterfly , the karner blue. The Karner Blue, Lycaeides melissa samuelis, is a small, blue butterfly found in small areas of New Jersey, the Great Lakes region, southern New Hampshire, and the Capital District region of New York. The male and female of this small (wingspan of about one inch) butterfly are different in appearance. The topside of the male is silvery or dark blue with narrow black margins. The female is grayish brown, especially on the outer portions of the wings, to blue on the topside, with irregular bands of orange crescents inside the narrow black border. The underside of both sexes is gray with a continuous band of orange crescents along the edges of both wings and with scattered black spots circled with white. Wild lupine is a perennial plant in the pea family with beautiful pink to blue flowers. 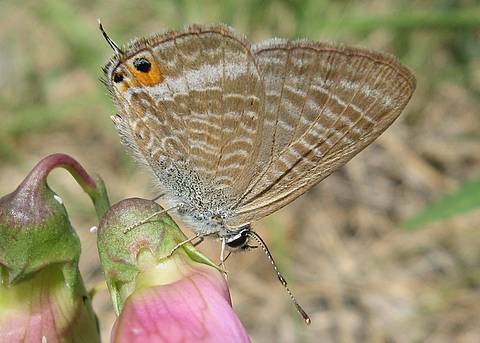 It is found primarily on dry, sandy soils in open to partially shaded habitats.karner blue feed on wild lupine. Due to effects of environmental variation and differing requirements among life stages, broods, and sexes, Karner blue butterflies require a mosaic of sun and shade.Adult Karner blue butterfly females are more likely to use shaded habitats than males. Avoiding harassment by males and compromising between greater amounts of wild lupine in open areas and better quality of wild lupine in shaded areas (see below) have been suggested as possible reasons for increased occurrence of females in shade. Larvae in shaded habitat apparently have an advantage over those in open areas. The increase in larvae in shaded habitats is likely due to effects of shade on wild lupine.Shade-grown wild lupine has been shown to provide higher quality larval resource than sun-grown lupine. Spiders and many insects are the major predators of Karner blue butterflies. The seven-spotted lady beetle is one of the few confirmed predators of Karner blue butterfly larvae.Paper wasps (Polistes spp. ), spined soldier bugs, and ants (Formica spp.) have been observed removing larvae,and the ant Monomorium emarginatum has been seen chewing on Karner blue butterfly eggs. According to reviews, habitat loss through direct conversion to other land uses and through succession are considered the major causes of the decline of the Karner blue butterfly.Habitat loss and butterfly collectors continue to threaten populations of the Karner Blue Butterfly. Collection is illegal without a permit from the U. S. Fish and Wildlife Service. Heya guys....Really Really sorry for being too late...Today i will be discussing about COMMON CROW BUTTERFLY. COMMON CROW BUTTERFLY(Euploea core):Itis a common butterfly found in South Asia. In India it is also sometimes referred to as the Common Indian Crow, and in Australia as the Australian Crow. It belongs to the Crows and Tigers subfamily of the Nymphalidae (Brushfooted butterflies).The Common Crow is the most common representative of its genus Euploea.The Common Crow (Euploea core) is a glossy black butterfly with brown underside with white marks along the outer margins of the wing. The wingspan is about 8-9 cm and the body also has prominent white spots. MALE COMMON CROW BUTTERFLY:Male's upperside dark brown, broadly paler along terminal margins; Fore and hind wing with subterminal and terminal series of white spots; on fore wing the former more or less oval, curved inwards opposite apex, the latter series often incomplete, not reaching apex, the spots smaller; often there is a small costal spot, and very rarely a spot in apex of cell and one or more discal spots; on the hind wing the inner series of spots are elongate, the outer conical. Underside similar, but ground-colour more uniform; cell, costal and discal spots on both fore and hind wing nearly always present. FEMALE COMMON CROW BUTTERFLY:Female's hindwing broadly ovate. Upperside dark brown, broadly paler along the terminal margins, especially on the fore wing. Fore wing with more or less incomplete and obsolescent series of subterminal and terminal small white spots, and a powdering of violaceous-white scales at apex, varying very considerably in extent from a mere trace of violaceous between the veins to a large and very conspicuous patch occupying the whole of the apex. Hind wing with a subterminal series of oval or inwardly conical and terminal series of more rounded white spots. Underside paler brown, the white spots larger, more clearly defined. Fore wing not violaceous at apex, a spot (sometimes absent) in apex of cell, and two or three discal spots. Hindwing: a spot in apex of cell, also sometimes absent, and a discal series of five small spots beyond. Antennae, head, thorax and abdomen very dark brown, and, the antennae excepted, sparsely spotted with white. HABITAT AND HABITS:It is found everywhere in India right up into the mountains till 8000 feet. Occasionally it swarms in the low, wet, jungles of South India due to the abundance of its foodplants which are spread over three orders of plants.The butterfly, being protected by its inedibility has a leisurely flight. It is often seen flying about shrubs and bushes in search of its host plants. It visits a large variety of flowering plant species. EGGS:Eggs are laid on the underside of young leaves of the host plants. The egg is shiny white, tall and pointed, with ribbed sides. Just before hatching the eggs turn greyish with a black top. CATERPILLAR:The caterpillar is cylindrical, vividly coloured and smooth. It has alternate white and dark brown or black transverse bands.The caterpillar bears four tentacle-like appendages, three towards the front and one at the back. All of them are curved backward at the tips. PUPA:The pupa of this species is shiny golden in color. The wing margins are marked with broad colourless bands. The abdomen has a row of black spots on each segment. The cremaster is black. The pupa later turns black. butterfly facts: skipper-butterfly or a moth?? The family hesperiidae belonging to the second superfamily hasw the Skipper butterfly.We all have been knowing that Skippers are butterflies.Although they are considered as butterflies , their appearance would suggest that they might be closely related to moths rathee than butterflies. First let us discuss the features of a moth.The wings of a moth are CONNECTED and when it is at rest , it holds its wings at level.A moth flies at dusk and during the night.Moths have fat furry bodies with feathery antennae.Some moth caterpillars produce silk and have a habit of making holes in woollen clothing. Unlike butterflies , Skippers have their antennae clubs HOOKED backward like a crochet hook whereas true butterflies' antennae are clubbed together with bubous ends.Skippers have feathereed antennae similar to moths.Skippers have thicker hairy bodies and larger compound eyes unlike true butterflies.When at rest, skippers keep their wings usually angled upwards or spread out, and only rarely fold them up completely. So these were the similarities between the characteristics of a skipper and a moth.You will be surprised to know Butterflies are divided into two main groups called skippers (hesperioidea) and true butterflies (papilionoidea). So now we have seen that the appearance of the skippper butterfly separates it from falling into the category of butterflies. I will be back with another amazing blog next week. Heya guys..back once again srry for being late..:(Today we will be discusssing about PEA BLUE BUTTERFLY. PEA BLUE BUTTERFLY(Lampides boeticus):It is a small butterfly found in Europe, Africa, South and Southeast Asia, and Australia that belongs to the Lycaenids or gossamer-winged family.The wingspan is 24-32 mm for males and 24-34 mm for females.It is also called Peablue, Pea Blue, or Long-tailed Blue. INTRODUCTION OF PEA BLUE BUTTERFLY:The Long-tailed Blue, or Pea Blue as it is often called, is the sole member of the genusLampides. Despite its small size and apparent fragility it is strongly migratory, able to cross seas, oceans and low mountain ranges with relative ease. It is one of the commonest and most widespread species in the Old World, breeding in southern Europe, almost throughout Africa, and across southern Asia to Indonesia and Australia, and reached New Zealand in 1965. The butterfly reached Hawaii in 1882 but has not yet reached the Americas, although it will almost certainly manage to do so within a few years, probably as a result of being accidentally introduced with an imported plant. In the Oriental regionboeticus is widespread and common, largely due to the use of one of its larval foodplants Crotalaria as a cover plant in rubber plantations. 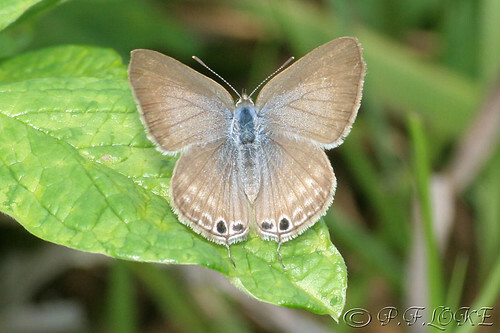 On the upperside males are pale blue with narrow dark borders. Females are dark earthy brown, with a slight flush of pale blue scales at the base of the wings. The pattern on the underside is unique, so this species is unlikely to be confused with any other. LIFECYCLE:The eggs are china-white and covered with a network of reticulations. They are laid on the flowers, sepals and flower stalks of herbs and bushes in the family Fabacea.The larvae when fully grown are cylindrical, and occur in several colour forms including dark green, yellowish green, and pearly white. All forms have a brown dorsal stripe, reddish lateral streaks and a brown head. The larva has a honey gland on the 7th abdominal segment which attracts certain ant species which milk it for the secretion. The presence of the ants is undoubtedly beneficial in providing a degree of protection against parasitoid wasps and flies. The larva is cannibalistic at all stages of its life, with the result that only one larva survives on each plant.The smooth rounded chrysalis is creamy or pale brown, with a dark dorsal line. It is usually formed at ground level, attached to a dead leaf. ADULT BEHAVIOUR:The migratory nature of the butterfly means that adults can be seen singly almost anywhere, but normally in the areas where it breeds several can be seen flying together around leguminous herbs and bushes.Both sexes nectar at a wide variety of wild and cultivated flowers. Males also visit damp ground to imbibe mineralised moisture, usually aggregating with other Polyommatine species.The antennae-like "tails" on the hindwings, together with the orange, silver and black "eyespot" at the tornus act together to create the impression of a false head, and divert the attention of birds away from the body. When the butterfly first settles it immediately turns around, and when it is feeding it often walks about in tight circles, thus a predator is never quite sure which direction it is facing. It also oscillates its hindwings causing the tails to wiggle like antennae. This reinforces the back-to-front illusion, and probably causes attacking birds to aim at the tail instead of the head of the butterfly, enabling it to escape relatively unharmed, leaving the bird with nothing but a piece of detached wing in its beaks. This all for today will catch you later on....till then bbye tc ciya and hv a nice day!!!!! Most easily confused with the Common Blue, it is generally slightly smaller and in the male the blue is a darker shade. The Common Blue also has an additional black spot at the base of the underside forewing. Silver-studded blue butterflies were released in the UK for the first time in 10 years today in an attempt to save the species from extinction. Fifty female butterflies were released by rangers from the local wildlife trust on Ockham Common in Surrey after being brought in from three nearby sites. The silver-studded blue (plebejus argus) was once common across the UK, but its numbers have declined significantly, dropping by 28% between 1970 and 1999. The species is now extremely rare and has become confined to small, fragmented heathland areas. The butterflies only travel an average of 30 metres in their lifetime, and barriers such as pine trees can stop them from moving from one area to another. This decreases the population and gene pool, creating the need for relocation programmes to ensure the survival of the species. The decline of heathland in Britain has also threatened the survival of the species as open land and commons have become broken up due to urbanisation. Today's project by The Surrey Wildlife Trust, in cooperation with Butterfly Conservation, English Nature and Elmbridge borough council, is the first to take place in UK for the last decade and the first ever in Surrey, the trust said. There are only 14 sites left in Surrey that support the silver-studded blue. The only other places where official releases of the butterflies have been made are in East Anglia and in Wales. Visited the Yamuna Biodiversity Park on 23 April11 along with my students - Aakarsha,Preet, Namrata & Sukriti - members of this project. The Butterfly Conservatory out there was an eye opener for all of us , as we saw the eggs, larvae and adults of so many butterflies on the host plants there, thanx to Ms. Niyang in the Park, who took us around and gave us first hand information.